DanaSchmoyer.com » Blog Archive » What a Wonderful Day! 22 Sep 2007 What a Wonderful Day! Today was great! I really enjoyed every minute spent with Tim. We relaxed this morning sleeping in and taking it easy. Then after lunch went to the main part of town for some craft fall fair or something going on. Our youth were selling baked goods to raise money for our Belize mission trip next summer. So we got to chat for a little while with the two girls manning the table. Then Tim and I went for a bike ride on the bike trail that goes through town. The bike trail I have been told goes from St. Cloud to Fergus Falls, a total of 185 miles. Tim and I only did 5 then turned back around to our car. We did make it to the next town though! 🙂 The trail is gorgeous right now with all the leaves changing colors. The trail has trees on both sides sometimes down in a hill, and at parts it goes between lakes which is gorgeous having water all around. Hopefully we’ll get a couple more good weather days for more bike rides before it gets too cold. After biking I cooked us dinner while Tim cleaned up. What a good husband! And then we picked a few apples from our best apple tree and I made apple cobbler. The topping was more like biscuits that the flaky cobbler I’m use to, but it is still good! We’ll have some more after lunch tomorrow. 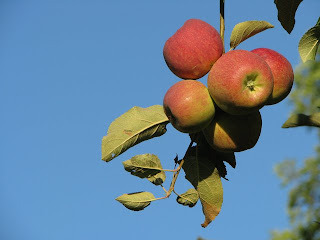 Our apples are great right now for cooking, and I want to use them for the holidays to make sweets for family, but I’m not sure how long the apples will be good for. I need to find out if I can freeze the apples after I peel and slice them and then get them out when needed, or what I can do to have them for the holidays.